What Axle Do I Need? If you are the DIY type or the heavy trailer user, you might need our Yoke Mount Axle. The Yoke Mount axle has M10 x 1 threaded studs on each side for attachment of a two sided trailer. This axle is compatible with the Extrawheel trailer, Surly Bill, Surly Ted and other not-so-common trailers. The Yoke Mount Axle does NOT work with a BOB Trailer – see our BOB Trailer Axles here. And sorry, but we do not fit the Topeak trailers. Our Yoke Mount thru-axles are for trailers that attach at both sides of the wheel. 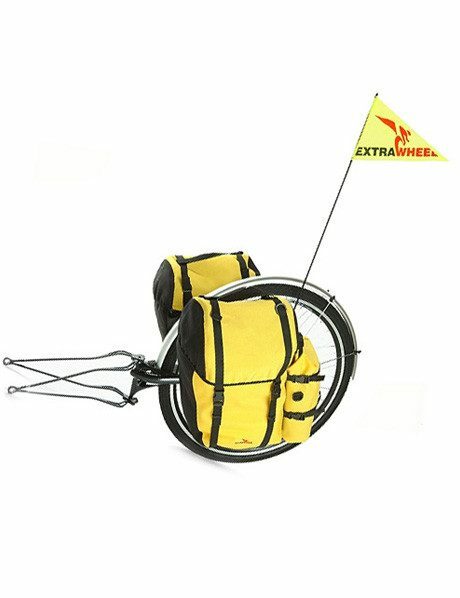 Extrawheel and the Surly Bill or Surly Ted are trailers that would be used with our Yoke Mount Axles. This axle is NOT for a BOB Trailer – see our BOB Trailer axles – and sorry, but we do not have an axle for a Topeak trailer. The Yoke Mount thru axle replaces your stock axle with an axle that has M10 x 1 threaded studs on each ends. 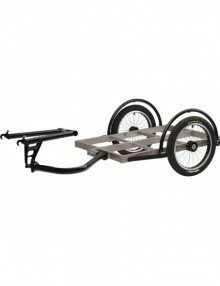 Compatible with the Surly Bill, Surly Ted and Extrawheel trailer. 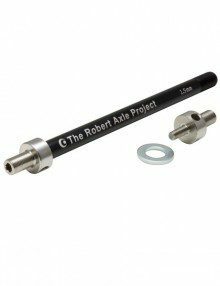 The diameter of this axle is 12 mm and the true length of the axle shaft is 198 mm. Spacers included for a 192 mm fitment. Please note: Thru-axle lengths do not equal hub standards. An axle has to be longer than the hub to fit in the frame. A 12×148 hub does not equal a 148 mm long axle. This axle has a 1.75 mm thread pitch. The axle shaft and axle end are precision CNC machined. The axle shaft is 7075 aluminum and hard black anodized for rugged durability. The axle ends are stainless steel, which allow for mounting of the trailer. Please note: This axle does not come with specific adapters for your trailer. You will need to purchase M10x1 nuts specific to your trailer separately. Designed, built and quality tested in the USA. Proven around the world. Need more information about how our axles work? View our Warranty & Returns page. All orders from our website are via US Postal Service, from Oregon, U.S.A. We make every effort to ship your order within one business day. We are unable to offer expedited shipping. If you need expedited shipping of our products, please visit our Dealers & Distributors page for options. We cannot take responsibility for any delays during shipping, including delays in customs or incorrect shipping information. Our 12 mm Yoke-Mount Axles provide threaded studs on both sides of the axle to adapt to your thru-axle equipped bike. Our axles are designed for maximum strength and versatility. The Robert Axle Project is the authority on attaching bike trailers and trainers to 12mm rear thru-axle equipped bikes.